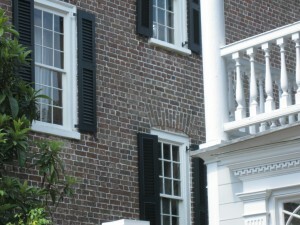 The “single house” construction that dominates historic Charleston features houses one room wide that typically stand very close to each other. This creates a common situation that is seen in quite a few locations in the city, where the side piazza is only a short distance from the windows of the house next door. In north-south situations such as 86-94 Church Street, the piazzas are all on the south side, where the door that opens into the house leads to a hall in which there is a staircase. In these narrow halls, the north-running stair turns halfway on a landing and proceeds south again to the second floor, and usually the landing is lighted by a northside window. From this landing window, overlooking the open expanse of the piazza next door, there is a natural tendency to linger and look over at what’s going on at the neighbor’s house. Traditionally, Charlestonians would spend many hours on the piazzas on pleasant days – socializing, relaxing, or enjoying time with family. This made it very easy for overly-inquiring minds to eavesdrop on family secrets, arguments, or romantic interludes that were not meant for the public, and tarnish the city’s reputation for politeness. So, there developed the saying “northside manners”, in which it was considered proper behavior to refrain from listening or viewing from that north staircase window on the south piazza privacy next door. I do remember in our “side hall” single house on Legare Street, the stair configuration was somewhat different, but the tempting northside windows were there, overlooking the southside piazza at number 10. With seven children in our family who were accustomed to passing information up and down the four-story house at the top of our lungs, it couldn’t have been much fun for those adults trying to have a peaceful cocktail under our watchful eyes and ears. So I remind myself and others that, should they linger overlooking a southside piazza, please remember your northside manners. Wandering historic Charleston along East Bay Street just south of the Old Exchange and Provost Dungeon is a delightful location that brings real character to the term “nooks and crannies”. It’s called the W. Hampton Brand Gallery, but don’t let the name make you think it’s only that, because although confined to tiny interior and courtyard of a narrow colonial building, there is an abundance of curiosities and memorabilia that compels visitors to linger. 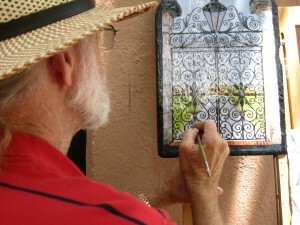 The gallery is operated by artist and South Carolina native W. Hampton Brand, who is usually seated on the sidewalk in front, busily crafting oil images with his paint brush and easel. 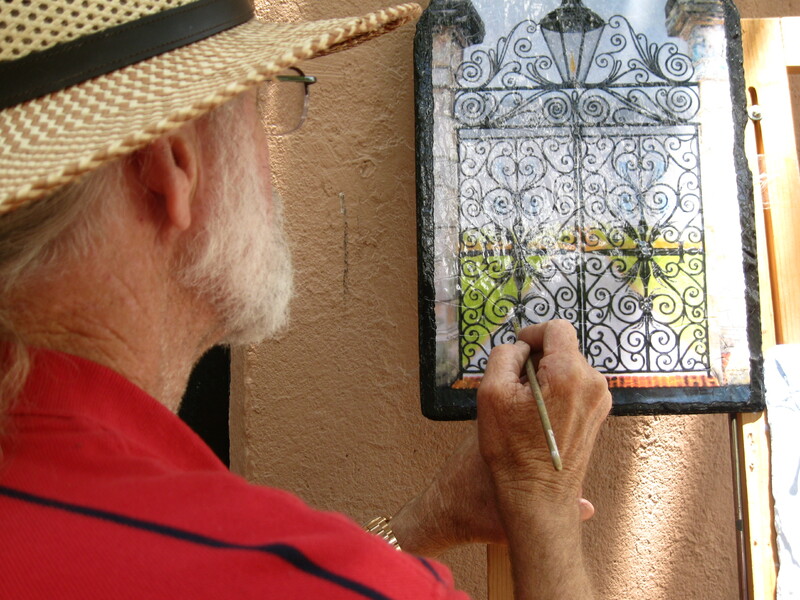 Hampton will paint on canvas, but the some of his most interesting works are done on historic bricks, glass, and slate, depicting such landmarks as Rainbow Row, the Old Exchange, and various classic wrought iron gates such as the Sword Gate. Hampton is one of those classically-untrained artists who took up painting when he was a kid, and had a knack for it, as well as a passion for history. His collection of historic bottles, masonry and other implements is an excellent reminder of the simple materials that were so essential to life in the colonial city. And by using these surfaces as the basis for much of his art work, Hampton follows in the footsteps of Charleston’s classic artisans by making those simple materials into things of beauty. 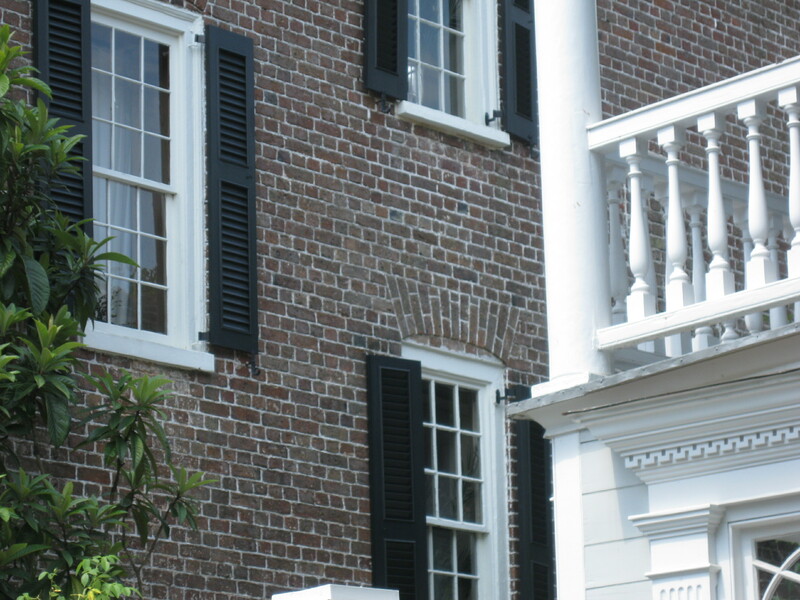 The gallery is in a structure that itself is one of the most unusual in Charleston. Built in the 18th century as adjoining commercial enterprises originally called Champney’s Row, it was constructed small and narrow to conform to city laws. Going back to the 1690’s, early Charles Town was protected along the waterfront by a brick barrier called “the curtain line”. To the east of the curtain line were wharves, and to the west the street that became known as East Bay, and the only passage between was through protected openings under guard. Fearing attack from pirates or other enemies who might land at he wharves and slip into the city, buildings allowed along the curtain line were restricted in size so that they could easily be pulled down in the event of invasion. Thus Hampton’s little shop is among the skinniest structures in town. To compensate for the possibility that the old shop might be ripped down, there is a massive underground cellar area that was apparently created to dump everything into. After the Revolution, the Champney family sold the premises to the Coates family, and the adjoining sections have been known as Coates’ Row ever since. Home to a long series of taverns, the underground areas became very useful as wine cellars over the years, and two doors down at The Tavern, Gary Dow operates the oldest liquor-dispensing location in America, but more on that in another post. Steam-powered fire engines were not used in Charleston until more than 40 years after Robert Fulton made the technology possible. For most of the city’s history, the “engines” were little more than pumps on wheels that were pulled by hand or by horse through the city to water wells dug in the streets. A variety of early pumping methods included the capstan barrel, with holes on six or eight sides to connect horse-drawn poles that would spin the device and create hydraulic pressure. The 1860’s brought the steam engine into prominence, as companies in the northeast created a variety of contraptions that used steam pressure for suction and spray. Some of these engines, fulled loaded with boilders, pans, gauges, and hoses, weighed more than five tons, so what draft animals pull through the streets of Charleston pales in comparison. After the first three city-wide fire houses were built in 1887, fires and heated water were constantly kept in separate non-mobile boilers for transfer to the engines to aid in rapid response to alarms, so that time was not wasted in waiting for the pressure to build. With successful digging of artesian wells in the city by the late 1870’s, a crude system of pressured water became available with mains and hydrants. 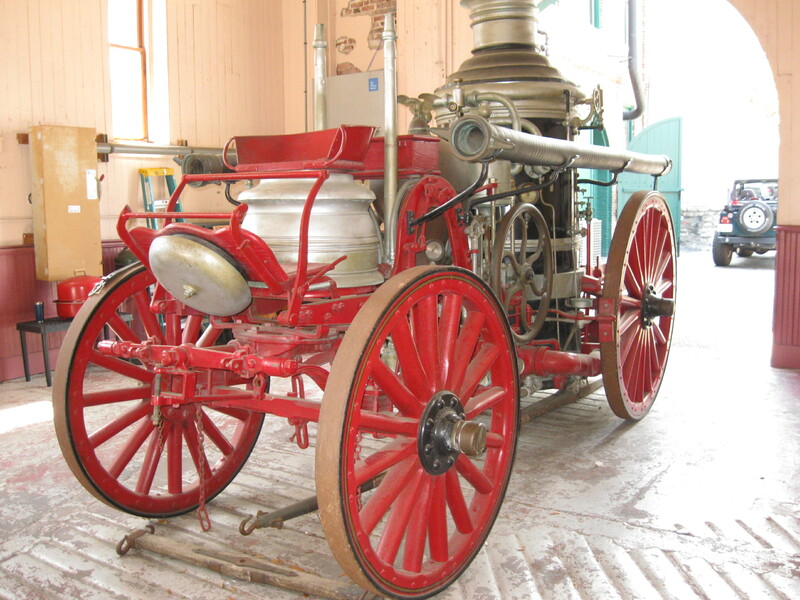 Steam engines pulled by horse were still in use into the 20th century, and the first motor-driven fire truck was purchased in 1912. Today, the old steamer in the picture stands inside the main fire house at 262 Meeting Street, as a reminder of the rustic nature of fire-fighting that served the city for so many years. Coastal South Carolina was once famous for its ancient forests that produced a thriving timber industry. Vast acres of oak, pine and cypress were cut for great ships and grand houses that were virtually impervious to rot and termites. Timber growing in natural settings typically takes much longer to mature, and many old-growth trees near Charleston dated in the hundreds of years, developing tight growth rings that assures durability. Trees such as the long-leaf pine were harvested in huge numbers, and cut in timber mills and sawpits all over Charleston for centuries. Most of local wood-producing establishments where built along the western bank of Charleston’s peninsula, where the timber barges would bring logs from up the Ashley River. Early mills used wind power to saw the huge trunks that were often hundreds of years old, and tides were impounded in expansive mill ponds to provide water power until steam took hold in the 1820’s. For many years, timber exports rivaled rice and cotton as one of Charleston’s most lucrative industries, and among the very successful enterprises was the Anderson Lumber Company at the West end of Broad Street. One of the Anderson company’s most notable projects was construction of houses on Sullivan’s Island in the early 1900’s, after the new island railway had opened up areas north of Atlanticville. One such structure was built for the Anderson family near tram station 27 – a gabled-two story sturdily constructed from the heart of the old-growth pine. Shortly after it was finished, the island was hit by a severe hurricane in 1911, and both family members and neighbors gathered inside the house as the swirling waters rose to dangerous levels all over the island. 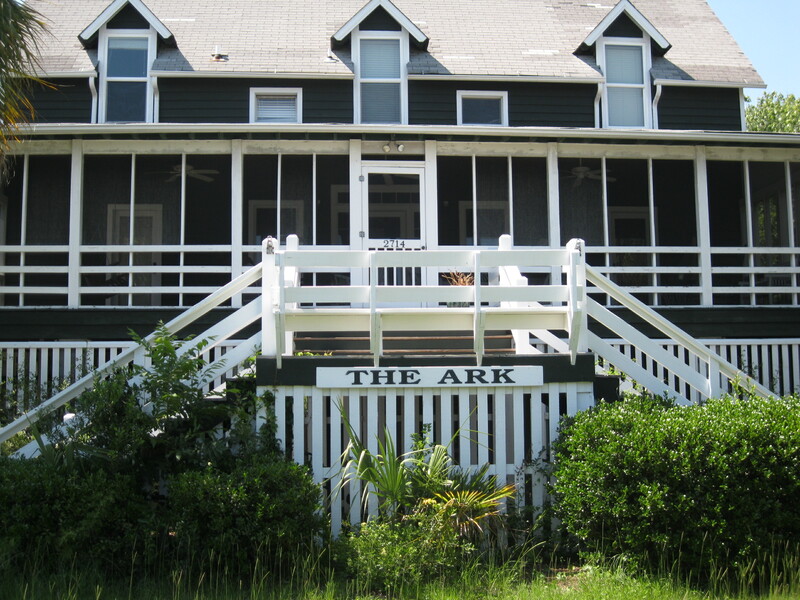 Many houses were completely swept away, but the Anderson house proved a lifesaver from the flood, and was christened “The Ark” – a name that it has been famous for ever since.